Members of the Kellogg Black Management Association and Dean Jacobs were presented with the National Outstanding Educational Institution of the Year Award from the National Black MBA Association. L to R: Troy Williams, Ursula Wright, Deborah-Ann Spence and Tracy Pruitt (all 01). 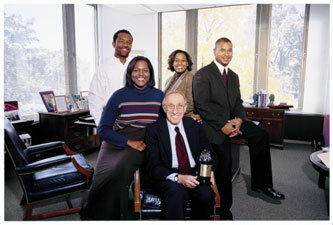 The National Black MBA Association (NBMBAA) selected Kellogg to receive the organization's National Outstanding Educational Institution of the Year Award for 2000. This award was established to recognize the institution making the greatest contribution toward encouraging African-Americans to enter the business field.Kellogg dean Donald Jacobs was presented with the award during the Scholarship and Awards Banquet at the 22nd annual National Conference and Exposition held at McCormick Place in Chicago in October. Jacobs had this to say about Kellogg receiving the national distinction: "Kellogg has always had a marvelous minority student body, one that's always been an important part of the Kellogg community and family. Like our achieving a perennially high business school ranking, the nice thing about winning this award is that it demonstrates that other people understand the quality that exists at Kellogg." The NBMBAA is a business organization active in the creation of economic and intellectual wealth for the African-American community.